Hello and Welcome from the AKC White German Shepherds and CKC & UKC Registered Wolf Dogs here at Chaparral Farm in the beautiful rolling hills, clean air, and countryside of southern Ohio. Our work is dog training and boarding. Our passion is the White German Shepherds and wolf dogs. Our passion with the White German Shepherds started over 35 years ago with the purchase of a male puppy from a White Shadow’s Chinookie litter. 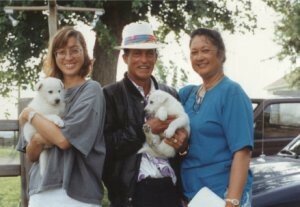 Along with a beautiful female puppy purchased from Phoenix Arizona we started our life with them in the gorgeous Alaskan territory. We have developed our uniquely beautiful, easy to train, large white shepherds from those two special animals, along with other carefully selected white shepherds from non related lines. 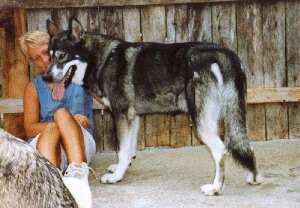 In 1990 we purchased our first Wolf Dog and another passion developed. We only breed these 2 types of dogs. The pure pedigree AKC White German Shepherds, and the Wolf Dogs. We also ex-ray the hips of all of our White Shepherds to help your new companion have a healthy and long life. While in the wilderness of Alaska we realized first hand that wolves are not aggressive animals like Hollywood tries to make them in their movies. These are highly intelligent animals with a strong family structure and a working relationship with each other that we could all learn from. For those of you with a love for nature and desire to be a closer part of it, the companionship and bonding of a well bred wolf dog has no comparison. Easily 80% of our customers have owned wolf dogs in the past – which we consider more accurate than any media hype to help sell their papers, or internet bashing. These are very loving and intelligent animals and we go to great expense in giving them and all natural dog food called Wysong -with no harmful additives or cancer causing ingredients, plus meat, raw meaty bones, vegetables, and their NuVet Vitamins daily. We also filter all of their drinking water to remove harmful chemicals. Some of our animals are on the Raw Food Diet for dogs which we highly recommend and you can research on the net. We own several animals in the 16 to 20 year old range with no health problems or arthritis. Along with a good diet – we use vitamins, herbs, and essential oils to keep them healthy and active. Our pups have enriched the homes of some very famous customers such as Chi Chi Rodriquez and family.